Copy of the signet ring of Childeric I (original stolen in 1831). Inscription CHILDIRICI REGIS ("of Childeric the king"). The original was found in his tomb at Tournai (Monnaie de Paris). Childeric I (/ˈkɪldərɪk/; French: Childéric; Latin: Childericus; reconstructed Frankish: *Hildirīk; c. 437 – 481 AD) was a Frankish leader in the northern part of imperial Roman Gaul and a member of the Merovingian dynasty, described as a King (Latin Rex), both on his Roman-style seal ring, which was buried with him, and in fragmentary later records of his life. He was father of Clovis I, who acquired lordship over all or most Frankish kingdoms, and a significant part of Roman Gaul. Childeric's father is recorded by several sources including Gregory of Tours to have been Merovech, whose name is the basis of the Merovingian dynasty. Gregory reports that Merovech was reputed by some to be a descendant of Chlodio who was an earlier Frankish king who had conquered Roman Gaulish areas in the Silva Carbonaria, then in Tournai, Cambrai and as far south as the Somme. This is roughly the definition of the Roman province of Belgica Secunda (approximately the "Belgium" defined by Julius Caesar centuries earlier, the region stretching from north of Paris to the Flemish coast) and later a letter of Saint Remigius to Childeric's son Clovis I implies that Childeric had been the administrative chief of this Roman province. In records from Childeric's own lifetime, he is mainly associated with the Roman military actions around the Loire river, where he appears in records involving the Gallo-Roman general Aegidius. According to Gregory of Tours, Childeric was exiled at some point, the reason being given as Frankish unhappiness with Childeric's debauchery and seduction of the daughters of his subjects. Childeric spent eight years in exile in "Thuringia" waiting to make a return. In the meantime, according to Gregory, Aegidius himself took up the title of king of the Franks. Upon his return Childeric was joined by the wife of his host, Queen Basina, who bore Childeric his son Clovis. "Although this is only one interpretation of the fragmentary sources, an eight-year period ending with Aegidius' death would allow us to associate Childeric's expulsion with Majorian's accession and appointment of Aegidius." "Majorian's commander on the Loire, Aegidius, refused to accept Severus as emperor. It is possible that, to legitimise his position, he took the title king of the Franks." In a passage normally considered to have come from a lost collection of Annals, Gregory (II.18) gives a sequence of events which are very difficult to interpret. In 463 Childeric and Aegidius successfully repelled the Visigoths of Theodoric II from Orleans on the Loire. After the death of Aegidius soon after, Childeric and a Comes ("count") Paul are recorded defending the Loire region from Saxon raiders, who were possibly coordinating with the Goths now under Euric. 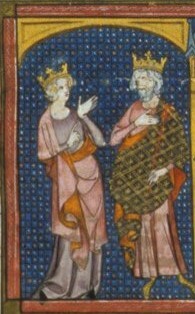 Childeric and Paul fought Saxons under the command of a leader named "Adovacrius" (sometimes given by modern authors in either an Anglo-Saxon spelling form, Eadwacer, or in a spelling the same as used for his contemporary the future King of Italy Odoacer, with whom he is sometimes equated). The origin of these "Saxons" is however unclear, and they are described as being based upon islands somewhere in the region. Soon after this passage, Gregory of Tours (II.19) reports that Childeric coordinated with "Odovacrius", this time normally assumed to be the King of Italy, against Allemani who had entered Italy. While some authors interpret these Allemani to be Alans, a people established in the Loire region in this period, there is no consensus on this, because the reference in this case is not apparently to events near the Loire. Gregory of Tours, in his History of the Franks, mentions several siblings of Clovis within his narrative, meaning that the following list of children of Childeric is known. Clovis I (died 511), whose mother was Basina. Audofleda, Queen of the Ostrogoths, wife of Theodoric the Great. Gregory III.31 also mentions their daughter Amalasuntha. Lanthechild. Gregory II.31 mentions she had been an Arian but converted to Catholicism with Clovis. Albofleda (died approximately 500). Gregory II.31 mentions that she died soon after being baptized with Clovis. Childeric is generally considered to have died in 481 or 482 based on Gregory's reports that his son Clovis died in 511 and ruled 30 years. Childeric's tomb was discovered in 1653 not far from the 12th-century church of Saint-Brice in Tournai, now in Belgium. Numerous precious objects were found, including jewels of gold and garnet cloisonné, gold coins, a gold bull's head, and a ring with the king's name inscribed. Some 300 golden winged insects (usually viewed as bees or cicadas) were also found which had been placed on the king's cloak. Archduke Leopold William, governor of the Southern Netherlands (today's Belgium), had the find published in Latin. The treasure went first to the Habsburgs in Vienna, then as a gift to Louis XIV, who was not impressed with the treasure and stored it in the royal library, which became the Bibliothèque Nationale de France during the Revolution. 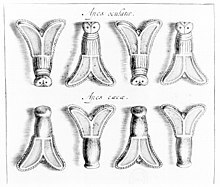 Napoleon was more impressed with Childeric's bees and when he was looking for a heraldic symbol to trump the Bourbon fleur-de-lys, he settled on Childeric's bees as symbols of the French Empire. On the night of November 5–6, 1831, the treasure of Childeric was among 80 kilos of treasure stolen from the Library and melted down for the gold. A few pieces were retrieved from where they had been hidden in the Seine, including two of the bees. The record of the treasure, however, now exists only in the fine engravings made at the time of its discovery and in some reproductions made for the Habsburgs. ^ G. Salaün, A. McGregor & P. Périn, "Empreintes inédites de l'anneau sigillaire de Childéric Ier : état des connaissances", Antiquités Nationales, 39 (2008), pp. 217-224 (esp. 218). ^ Shades of Indignation: Political Scandals in France, Past and Present: "Childeric I (437-481)"
^ The date 481 is arrived at by counting back from the Battle of Tolbiac, which Gregory of Tours places in the fifteenth year of Clovis's reign. ^ Alain de Benoist, Dictionnaire des prénoms, d'hier et aujourd'hui, d'ici et d'ailleurs, p. 294, éd. Jean Picollec, 2009. ^ Thuringia is a term which surviving manuscripts of Gregory used in this ection to describe the region on the Roman side of the Rhine where Chlodio's original fort was. It may refer to the region of Tongeren. On the other hand many modern authors are encouraged by the find of a spoon in Weimar with the name Basina, showing that the name was genuinely used in Thuringia. ^ Gregory of Tours, History of the Franks, II.12. ^ Halsall "Barbarian Migrations and the Roman West 376-568" pp.266-7. ^ "Location of Childeric's grave: A plaque at the site reads (in French): "Childeric King of the Franks Died in his palace in Tournai the year 481. His tomb was found in this place in the year 1653"". Archaeology in Europe. Archived from the original on 2015-07-01. Halsall, Guy (2007). Barbarian Migrations and the Roman West 376-568. Cambridge University Press. ISBN 978-0-521-43543-7. James, Edward (1988). The Franks. Basil Blackwell. ISBN 0-631-17936-4. Murray, Alexander Callandar (2000). From Romans to Merovingian Gaul. Higher Education University of Toronto Press. Nonn, Ulrich (2010). Die Franken. Kohlhammer. ISBN 978-3-17-017814-4. Wallace-Hadrill, J. M. (1982). The Long-Haired Kings. Toronto: University of Toronto Press. ISBN 0-8020-6500-7. Wood, Ian (1994). The Merovingian Kingdoms 450-751. Routledge. ISBN 978-0-582-49372-8. Wikimedia Commons has media related to Childeric I. "A note on Childeric's bees": the discovery of his tomb: follow the links for the engravings of Childeric's treasure and the two remaining gold bees. Chisholm, Hugh, ed. (1911). "Childeric" . Encyclopædia Britannica. 6 (11th ed.). Cambridge University Press. p. 137. Year 457 (CDLVII) was a common year starting on Tuesday of the Julian calendar. At the time, it was known as the Year of the Consulship of Constantinus and Rufus. The denomination 457 for this year has been used since the early medieval period, when the Anno Domini calendar era became the prevalent method in Europe for naming years. Merovech is the semi-legendary founder of the Merovingian dynasty of the Salian Franks, which later became the dominant Frankish tribe. He is proposed to be one of several barbarian warlords and kings that joined forces with the Roman general Aetius against the Huns under Attila at the Battle of the Catalaunian Plains in Gaul. 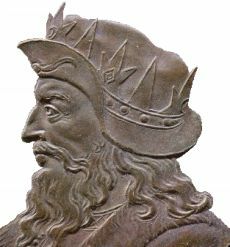 Syagrius was the last Gallic military commander of a Roman rump state in northern Gaul, now called the Kingdom of Soissons. Gregory of Tours referred to him as King of the Romans. Syagrius's defeat by king Clovis I of the Franks is considered the end of Western Roman rule outside of Italy. He inherited his position from his father, Aegidius, the last Roman magister militum per Gallias. Syagrius preserved his father's territory between the Somme and the Loire around Soissons after the collapse of central rule in the Western Empire, a domain Gregory of Tours called the "Kingdom" of Soissons. Syagrius governed this Gallo-Roman enclave from the death of his father in 464 until 486, when he was defeated in battle by Clovis I.
Chlodio also Clodio, Clodius, Clodion, Cloio or Chlogio, was a king of the Franks who attacked and apparently then held Roman-inhabited lands and cities in the Silva Carbonaria and as far south as the river Somme, apparently starting from a Frankish base which was also technically within the Roman empire. He is known from very few records, but it is thought that he might be an ancestor of the Merovingian dynasty, and possibly a descendant of the Salian Franks reported by Roman sources in the 4th century. Frankish mythology comprises the mythology of the Germanic tribal confederation of the Franks, from its roots in polytheistic Germanic paganism through the inclusion of Greco-Roman components in the Early Middle Ages. This mythology flourished among the Franks until the conversion of the Merovingian king Clovis I to Nicene Christianity, though there were many Frankish Christians before that. After that, their paganism was gradually replaced by the process of Christianisation, but there were still pagans in the Frankish heartland of Toxandria in the late 7th century.